This tool is awesome and always applicable! I love having it on the go with me. If you can't get to your AA or Al-anon books (I travel a lot), these books are a great way to keep up with your daily meditations. The writings are beautifully written and inspiring! This little book is packed with powerful answers to every day life. It all depends on if you are in the right place to receive it. If it doesn't speak to you, put it on tHe shelf for awhile, and pick it up later. You may be surprised. This is a great App! I love having the inspirational quotes with me where ever I go! I look forward to reading each day! This gives me food for thought every day and reminds me how grateful I am to be sober. Helps me to maintain my spiritual growth. Allows me to take a few minutes of each day for me. With all the negativity that tests my spiritual grounding, it's nice having this that starts my day with a plus. Thanks for having this app. 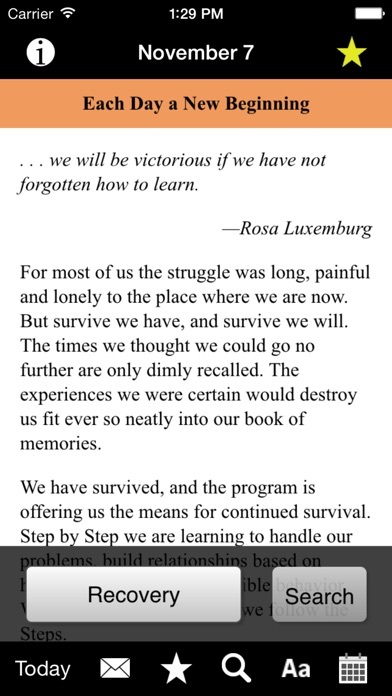 My home group in recovery has a closed group on the internet and I love posting these readings for everyone! This app is an essential element in my Recovery Toolkit. I highly recommend it to any woman who wants to maintain her sobriety. Love this daily meditation. Always seems to be exactly what I need to read for the day! I LOVE that this book is an app. Best way to start day- and so cool to be able to mail and share with others. I have a son who suffers from schizophrenia. The daily message also helps with the stress of this horrible disease. I am so glad I found this app. It has truly changed my life!! I travel and now do not have I choose which book to take with me. Else I wouldn't choose this. I look forward to my daily reading,great wake up message. I love this App! It is such a relief to have perspective at the tip of my fingers. Definitely worth the money. I have used this meditation book for 30+ years of sobriety. Having it so handy on my iPhone makes accessible anytime I need to touch base with an inspiring thought and remind me of my recovery. I've been reading this book for 26 years, I am so happy to have the app at my finger tips! I find the messages outstanding. Someone called them simplistic; often simple is the most profound. To have this on your phone accessible anywhere at any time is the best!! If I at work and stressed, I can take a moment and read today's and my day can change. I've been sober for a while and got out of the habit of reading this type of meditation. It's a great way for me to remember how to live soberly every day. But it's not jus Thor folks on recovery. The readings apply to anyone who struggles with living life fully. Even if I don't get to each days readings, I can't say how much this app has touched and helped and guided me through my day! So many times it has been spot on with what was occurring in my life. Other times it just gave me something to ponder on. It gives you insights you may have not considered. Yes there is some God referencing, but it is neither heavy handed or enough to make those nervous about these references not find the vital information in each days reading. We can all use a bit of guidance, positive reinforcement and self reflection! I got this book the 1st year I got clean; almost 6 years ago. We use it at a women's NA meeting we started over 3 years ago. I was so excited to find the app b/c I love it! Love this book and really love the app! I Read it everyday and forward the daily reading to friends each morning. My day is not complete without it! The daily reflections and quotes are so well written that I re read them many times a day. The option to star favorite days is like a convenient bookmark. 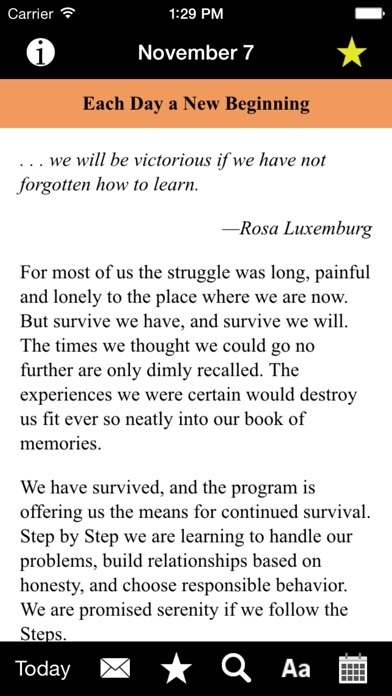 I find it useful to be able to send a days reading directly to any email to share the wisdom. The font is lovely and it can be used year after year! These apps help me to stay grounded. Easy to use recovery help at your fingertips! I love waking & reading the meditations. This book has gotten me through many difficult days -I read a page every day. I would recommend it highly. What a way to start each day!! Love it! Couldn't be more grateful to start each day in prayer with this meditation. This is a fabulous tool in my toolkit. This app. gives me such focus for he day , it lifts me up. This is one of my favorite apps! Very inspiring & helpful. What a blessing to have an app like this right at our fingertips. 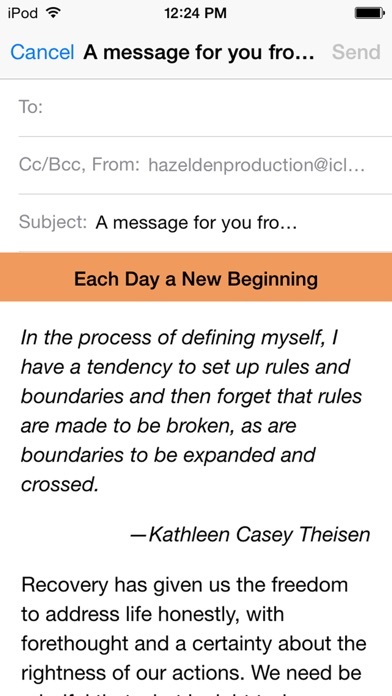 I can start my day with her writings each day.... and the best part it's right there if I need to remind myself that each day really is a new beginning ... No matter how many times I need to start over. Very uplifting- applies to all my addictions. Nice to have one geared toward women's issues in particular. Can't wait to read this each day. It's beautiful AND spiritual and just what a person needs to make it through good times and bad. 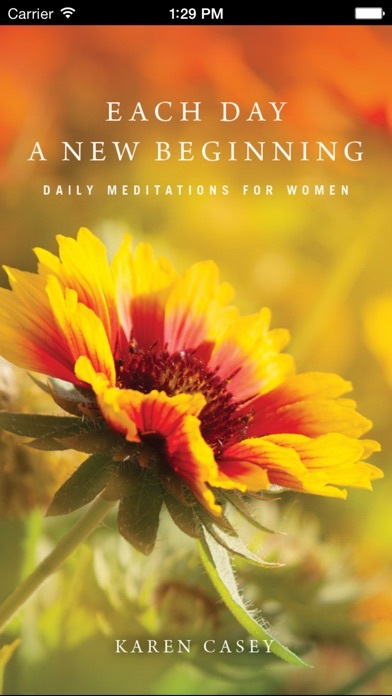 This daily meditation book is in my top three because of the gentle and uplifting reflections and meditations. The daily reflections are conveyed in a warm writing style that is easy to comprehend, which really lends itself to understanding and benefiting from the message. I've used Each Day a New Beginning for almost 30 years as part of my daily ritual to get centered at the beginning of the day. Early in recovery I found a different view of life and and what is important. I learned I could act rather than react. After many years I still find new concepts in the book to fortify my recovery. I've also shared it with friends and family members. Grounds me! So helpful to remind me what is important. Terrific to start each day. Very helpful! I like to use this as a pick me up mid morning/afternoon. It helps keep me focused in today. Excellent app! I bought several like this for daily readings & this is my favorite. Great quotes & insights every single day! It is well worth the price. 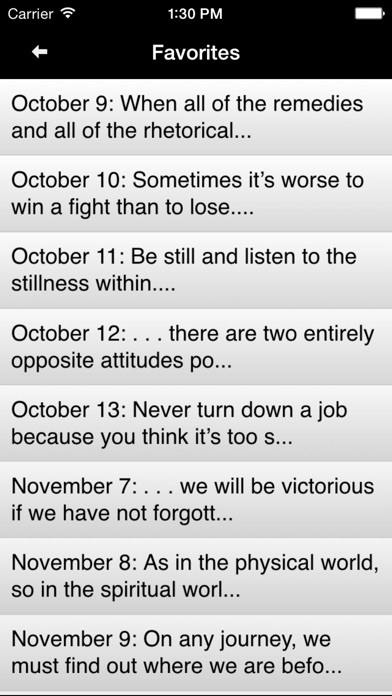 I find these daily meditations very helpful. I've had the book for years and the app is perfect for travel.